A turtle crawls towards the water. Photographs from Wikimedia Commons. “Quiet please, we have to move away quickly. She’s coming this way," Nasser whispered. A massive 4ft-long creature lumbered up on the sand in the faint moonlight. Magnificent as she was, this was no time to stop and stare. I inched away, thrilled, but I also felt like I was an intruder. I was on her turf, and I was aware of it. To my right, hundreds of pint- sized creatures, miniatures of the larger one, erupted from the sand. Through the year, thousands of Olive Ridley, leatherback, logger-head, hawksbill and green turtles migrate here from the Arabian Gulf and the Red Sea to lay their eggs. It’s the only beach in the world where the endangered green turtle—the second largest turtle in the world—comes every night to nest, setting up an average of 30,000 nests in a year. My first brush with sea turtles had happened while scuba-diving off Lakshadweep 12 years ago, and I had wanted to observe them at length ever since. I had narrowly missed an opportunity to watch Olive Ridleys nesting on the shores of Odisha a year ago. 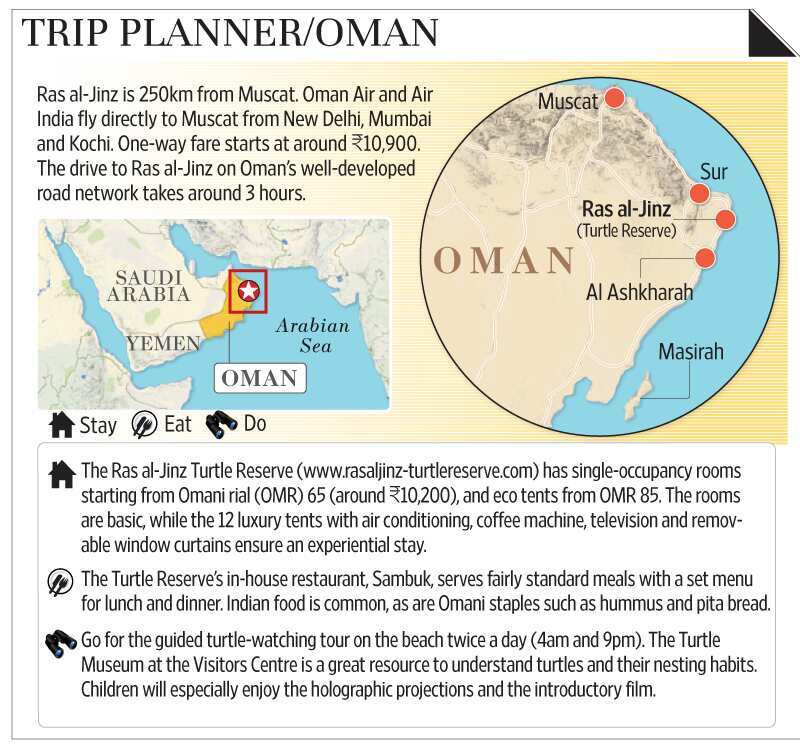 I wasn’t about to pass up an opportunity to spot the elusive green turtle during this trip to Oman. I arrived at the Ras al-Jinz Turtle Reserve from Muscat on a muggy Saturday afternoon, excited at the possibility of being up close with a real sea giant. At 8.30pm, around a hundred guests of the reserve piled into the lobby, ready to step out and tail green turtles on the adjoining Ras al-Jinz beach. Our guide Nasser Al Zedjali began the hour-long beach tour at 9pm. “Green turtles live up to 80 years and mature around the age of 18-35," Nasser said as he led us across the sand by torchlight. “One female mates with five to eight partners and comes here to lay her eggs," he continued. In the dark, I could make out the outline of a head, on which a tiny eyelid batted. The boulder, I realized, was an enormous green turtle in the process of laying eggs. Pointing at it, Nasser said, “The turtles are very sensitive just before nesting. If we disturb her, she might go back to the ocean without laying her eggs. We have to be quiet. We can’t use lights." I crouched at the rear edge of the pit, and watched as three ivory-coloured, golf-ball-sized eggs plopped into a tiny “egg cavity". Green turtles bury their eggs more than half-a-metre deep in the sand. A female turtle digs a little hole or an “egg cavity" within the pit to lay her eggs—another layer of protection from predators such as foxes that roam the area looking for easy prey. At a time, a turtle lays 100-150 eggs that incubate and hatch after 55-60 days. Female turtles don’t raise their young. They leave their hatchlings to fend for themselves. “After laying her eggs, this mama will go back to the ocean. No parenting responsibilities," Nasser said. The beach was an uneven landscape of large and small pits, much like the moon’s surface. Many of these were “decoy" pits, dug by turtles to trick predators such as foxes and crabs into believing there were eggs buried underneath. We manoeuvred our way around these, stopping a few metres short of another turtle slowly plodding her way up from the ocean, looking for an ideal spot to nest. At the same time, Nasser gestured frantically in the opposite direction. Hundreds of little black hatchlings crawled out of the sand and waved their tiny flippers. These had just hatched, they were only minutes old. Our group promptly erupted into a chorus of “awws". It was incredibly cute, and I felt lucky at being able to witness such a rare sight. The staff at the reserve don’t interfere with the baby turtles’ arduous walk to the ocean in spite of the fact that there are natural predators like crabs and gulls around. Their philosophy is to let nature take its course. Nasser folded up his flowing white dishdasha (a full-length, full-sleeve traditional robe worn by Omani men), scooped up a handful of hatchlings, and plonked them into his robe’s pocket. Another guide shone a torch towards the ocean, trying to guide the hatchlings towards the water. Some hatchlings scampered off towards the water, and other errant babies headed stubbornly in the opposite direction. A little one scurried on to my feet. It tickled me. I wanted to squeal. But I stood still, not wanting to hurt it. Nasser picked up the newborns from the sand and off our feet, clearing the area of baby turtles that we might unknowingly step on. Once set loose in the ocean, they furiously battled the waves. Large crabs scuttled along the shoreline, waiting to prey on hatchlings. Baby turtles are often carried off by foxes and crabs. Many hatchlings that do make it into the water are eaten by birds and fish. Unsurprisingly, only one or two out of a thousand hatchlings eventually survive to reach adulthood. That night, though, perhaps because our guides kept plonking hatchlings into the water, I did not see any carnage. She inched her way towards the ocean, exhausted from all the work she had had to do to hide her eggs. She left no trace of where they lay buried. The nesting process often takes up to 2 hours, and the 20ft walk back to the ocean can last much longer at a turtle’s pace. The green turtle we tailed for close to 90 minutes was carried off by the waves within moments. She left in her wake tracks like those of a military tank, but not much else. We stood around for a while, watching her swim into the blackness. Nasser broke the spell: “Khallas! Say bye-bye to this mama." Malavika Bhattacharya is a freelance travel writer based in New Delhi.